Pears, pears, pears and a fabulous pie! I think this shall be dessert on Sunday. What say you? 😉 Have a fabulous weekend y’all!! 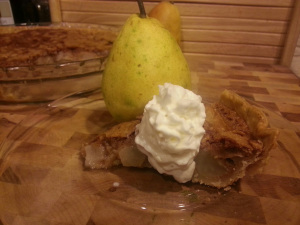 …and check out this Pear Custard Pie! I was a tomboy growing up. I mean a TRUE tomboy. Like a tree climbing, Big Wheel ridin’, dress hatin’, t-shirt wearin’, football playin’, frog chasin’, blue jean lovin’, fish catchin’, lipstick gaggin’, constant skinned knee’d, dirty faced, all American, tomboy. (Insert BIG grin here.) I wanted to BE a boy. Except I liked boys. And I hated boys. It was all pretty confusing. Not much has changed. There was a pear tree in our yard that was the absolute best tree for climbing. During fruit season, it even provided snacks! I was like a monkey swinging from those branches. I read books there, took naps, did homework, ate my body weight in pears and just daydreamed listening to the birds and crickets. Man what kids really miss these days. They have no idea.